This is a totally unconfirmed rumor -- as are all Prince-related rumors -- but we got a Facebook message from a reliable cohort that the Purple One may be making a cameo at the Gayngs show tonight. No word on whether he's going to perform or just stand there looking cool. Perhaps he'll just have a minion shoot a cloud of purple smoke into the mainroom and call it a day. Or not. But we're crossing our fingers! He was there. I was next to him back stage as he was plugged in and playing offstage so nobody could see him. He was smiling and loving the show. Band members kept trying to encourage him on stage but at one point he unplugged his guitar turned and said, "They don't need me up there". Apparently he was impressed and wanted them to have their limelight. I was at the front row and spotted him at the edge of stage right for about 20 seconds with the biggest smile on his face and guitar in hand. Wow, very cool story/rumor. Dig it. 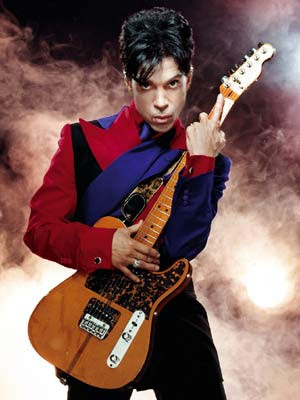 However... kind of sets up awkwardly now for when Prince does join a band on stage for a song, right?